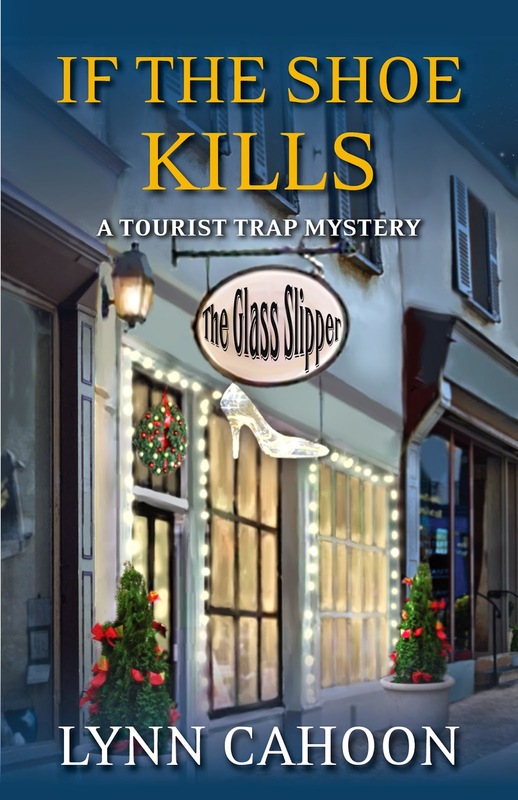 By Jill Gardner from If the Shoe Kills, book three of the Tourist Trap Mystery series by Lynn Cahoon. Pour me another cup, I’m not quite awake yet. Wait, that’s my job. I’m Jill Gardner, owner of Coffee, Books, and More. We’re located in South Cove, just off Highway 1 in central coastal California. My morning shift here in the coffee shop is almost over and I’ve had a great day. Of course, I measure the success of my shift in the amount of reading I’m able to complete in between customers. My Aunt Jackie, on the other hand, measures success in the number of sales. I think my way is better. I don’t know about you, but I’m so glad the holidays are over. It was a crazy time in South Cove. Especially after I found Ted’s body in his classic cherry red Mustang. However, I’m starting the story in the middle. You need to know why Ted was here in the first place. You see, Mayor Baylor contracted with Work Today, the work experience program Ted managed in Bakerstown. And, as with most of the mayor’s bright ideas, he put me in charge of finding work sites for ten participants. My shop could only handle one ‘intern’ as Ted liked to call them so I had to go begging for sites. I even talked my neighbor, the one who owns The Glass Slipper, into joining in the fun. Then Ted got mean and controlling, and I thought Toby, the noon barista (and part time deputy), was going to deck him. Sure, like I couldn’t handle a bully. Sometimes men just don’t know when to back off. And there I go, telling you the story all out of order. Instead of me messing things up, why don’t you check out If the Shoe Kills where my writer has a detailed blow by blow of the entire event? Me, I’m heading out to the beach with Emma for our daily run. I need time to clear my head after a long shift at the coffee shop. Emma wants to find some dead fish to roll in. Hopefully, only one of us will get our wish. If you stop in South Cove, make sure you visit my shop. I’ll even treat you to a cup of coffee. But before you go, tell me, are you happy it’s January? Or do you wish the holiday season would never end? Jill and I appreciate being here. Big thanks to Molly MacRae and the rest of the Killer Character bloggers. I know, I'm finishing up my December list, but making good progress.... Thank God for to do lists. :) Hope you get your walk on the beach, guys! I wish the holidays lasted a little longer. It seems there is so much build up to them and then suddenly they are over. It is also my birthday season so it is doubly sad when it is all over. Anyway, I will have to look for this series. It sounds very good! Are you kidding! I wish it was summer. Although I don't deal well with heat, at least the heat doesn't make my joints ache. I must admit that January is one of the longest months in the year to me. The lack of sun and all the dreary clouds can really make someone want to hibernate. I have to say even though it's been cold, it's been dry here. My joints don't like the cold either, but wet and cold is worse. :) Here's to a warm spring. I celebrate the holidays through Epiphany, and even now, all my holiday items are still not put away. I much prefer cold to heat-so January doesn't bother me. That's a great way to keep the holiday spirit going. I'm always cold, or at least that's what my husband says, so even when it's hot, I can find a chill. We've had a pretty January here, which included three trips to the cabin. January just means I am one month closer to Spring. Here I just have to get through Feb before it starts to warm up in March. Oh I would be all about a beach walk or run right now. Sadly in AZ there is no real beachy places to roam. A lake will do nicely though and we do have that. I am happy when we feel some winter here. I live where we get a good mix of seasons. I am not quite ready for the holiday and winter season to end...just yet. Kelly, I love walking either the levee or the river road near the Mississippi.